For Kiwi educators who want to upgrade their Second Life skills the Second Life Kiwi Educators group will be running a number of sessions in world during the second week week of the New Zealand semester break to familiarise users with a number of different aspects of this multi-user virtual environment. Led by Kiwi Educators co-founder Aaron Griffths/Isa Goodman these sessions will generally last two hours and cover topics such as terraforming, sound and music, particle systems and animations. Sessions are restricted to Kiwi Educators group members (membership is open) and will consist of a maximum of 10 participants for each session. The first session on terraforming (shaping the landscape of Second Life) will be held on October 8 between 12 pm and 2 pm. Isa will look at the basic theory of terraforming, the terraforming toolset. Participants will get to play with these tools on NMIT’s new island, Kowhai. Kowhai is currently a bare piece of land and is ideal for such a session. As the opportunity for terraforming is rarely avaiable to most people this session is expected to fill fast so if interested it is suggested that you get in quick. In the interview Dr Parris, VP Digital Convergence at IBM, exposes a lot of the thinking behind IBM’s’s significant investment in virtual worlds. He talks about how the 3D internet became a focus and internal startup within the company. He then covers collaboration and training and it’s work with companies like Aviva and the recent integration of SameTime and Lotus Notes with OpenSim. Charley Lemon and Hinemoa Hudson – stereotyping? 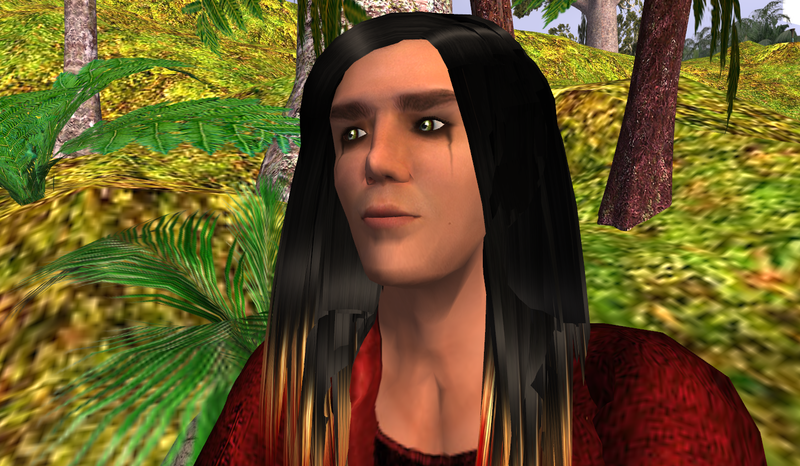 Amazingly the colour of one’s avatar’s skin appears to matter in Virtual Worlds. This is even more surprising when one considers that all sorts or avatars/creatures inhabit Virtual Worlds from ordinary humans, to nekos, to furries, to anthromorphs, centaurs, minotaurs, vampires and demons and other assorted monsters from fairytale, legend and some very creative imaginations. But, as ScienceDaily reported earlier this month ( http://www.sciencedaily.com/releases/2008/09/080909074104.htm ), the fun and games do not appear to be divorced from the real world when it comes to colour – an interesting observation for a hopefully, colour-blind country such as New Zealand, even though most Kiwis on-line with some notable exceptions – as when they are overseas – appear to be New Zealanders rather than Pakeha or Maori. Two social psychologists from Northwestern University, Paul W. Eastwick, a doctoral student in psychology, and Wendi L. Gardner, associate professor of psychology and member of Northwestern’s Center for Technology and Social Behavior, who conducted experimental field studies in a virtual world found that avatars responded to social cues to help one another — and revealed racial biases – in the same ways that people do in the real world. In both of the classic door-in-the-face (DITF) social psychology experiments used for the study in There.com, a relatively unstructured online virtual world, one avatar tried to influence another to fulfill a request. In one of the most striking findings, the effect of the DITF technique was significantly reduced when the requesting avatar was dark-toned. The white avatars in the DITF experiment received about a 20 percent increase in compliance with the moderate request; the increase for the dark-toned avatars was eight percent. “For decades, research has shown that the outcome of that reciprocity-inducing technique is affected by how the requester is perceived, whether a person — or in this case an avatar — is deemed worthy of impressing,” Gardner was quoted as saying.. Despite the world being fantasy the finding is consistent with studies in the real world as well as the few in the virtual world that clearly demonstrate that physical characteristics, such as race, gender and physical attractiveness, affect judgment of others. The soon to be released Virtual Worlds, Real Libraries: Librarians and in Second Life and Other Multi-User Virtual Environments (Paperback), by Lori Bell (Author), Rhonda B. Trueman (Author) at $US39.95 will be available from Amazon shortly ( http://www.amazon.com/Virtual-Worlds-Real-Libraries-Environments/dp/1573873616/ref=sr_1_10?ie=UTF8&s=books&qid=1222371587&sr=1-10 ). Best to wait for the first reviews before ordering though. Kiwis, probably because of its small population and the lack of a 21st century telecommunication structure or pricing regime – yes dear Kiwis, Telecom and TelstraClear are still ripping us off and treating us like mushrooms – failed to make it out of the “others” class in the latest Second Life measurements. Concluding that Second Life had had no significant growth in the latest reporting period she mourned the fact that Linden Lab is not publishing detailed monthly information anymore. She summed up the changes for August compared to the July figures as: User hours showing little or no real growth, only 120 new private simulators (no growth in mainland), Accounts with positive monthly flow down, L$/US$ exchange rate stable, Lindex currency exchange activity down, premium accounts continuing to fall. On the other hand, she said, demographically Second Life is still firmly in the hands of Baby Boomers and Generation X, with younger users statistically remaining unengaged with the platform. As expected the US leads the user count with 40.13%, but Germany is second with 9.99%, the UK third with 6.82% and Japan fourth, with 6.09%. While New Zealand remains in the “others” at a total of less than 8%, Australia holds 11th place with 2.01% of the users. There is an often fiery debate going on the US-based HASTAC Scholars Forum (http://www.hastac.org/scholars/forum/09-22-08Metaverses-and-Scholarly-Collaboration) which has spread to the Second Life Education (SLED) list. It’s on whether Second Life is providing “fabulous opportunities or over-hyped fabulation” for education. It has resulted from a sometimes tongue-in-cheek video put up by Ana Boa-Ventura, a graduate student, Radio-TV-Film, at the University of Texas, at Austin. In it she suggests that Metaverses might through their sense of ‘presence’ through embodiment, bring the ‘humane’ back to scientific collaboration. She notes that although scientific visualization is core to the cyber-infrastructure, it often attains a level of abstraction that hinders rather than encourages those modes of communication most germane to humans – vision, gesture, voice. “Could Metaverses, by adding embodiment and hence these more natural modes of communication, be the missing link that invites humanists, social scientists and artists to participate and explore the vast amount of computing resources now available in the Grid?” she asks. Speaking of Second Life in Higher Education environments, she says, there have been few technologies in recent years that have caused such a split in the academic world between advocates and dissidents as Metaverses, particularly Second Life, have. She then lists the criticism of Metaverses – disputed by some – as being: Instability and lack of interoperability with other Internet applications; proprietary technology; the uncertain future of user-generated content; a parallel economy – of superficial values; An idealized World; The resistance of funding agencies; The scholarly generational gap in research and teaching in SL; and the problem of metrics in SL. On the propoents side, she says, is: Critical mass which provided a stimulus to the development of standards for Metaverses; corporate R&D investment; innovation and a vast knowledge base. There also was interoperability with other Internet applications; innovative End-User License Agreement; non-profits’ fundraising; and Metaverses being used as a new medium of artistic expression. Amanda Lenhart, Joseph Kahne, Ellen Middaugh, Alexandra Rankin Macgill, Chris Evans, and Jessica Vitak have come up with some interesting and perhaps surprising data from the first US national survey of Teens, Video Games and Civics. With virtually all American teens playing computer, console, or cell phone games, they found that teens’ gaming experiences are diverse, rich and varied and, perhaps surprisingly for some of the older generation, include significant social interaction and civic engagement. Game playing is universal, with almost all teens playing games and at least half playing games on a given day. Game playing experiences are diverse, with the most popular games falling into the racing, puzzle, sports, action and adventure categories. Game playing also is social, with most teens playing games with others at least some of the time and incorporating many aspects of civic and political life. Jeremy Kemp (SL: Jeremy Kabumpo), the Assistant Director, SL Campus,SJSU School of Library & Information Science, describes the Global Kids Second Life Curriculum (http://www.rezed.org/group /GKslcurriculum) launched at Tampa and in Los Angeles a couple of weeks ago , as stunning as do a large number of other educators. He says he has already used it “with my grad students to great effect”. Although 430+ pages and covering ALL the basic skills in a handy format he says, however, he says it needs a teacher’s edition with Web 2.0 and 3D supplements, which he has created as a set of Extensions. A PDF version of the teachers’ guide with color cover and all nine levels bookmarked and numbered for easy reference is available from http://simteach.com/gkcx/GKCxComplete_0908.pdf (10Mb). It also will available in a print . Saturday, October 27 (AEST): Jokaydia Unconference. Jo Kay aka jokay Wollongong, facilitator of the Islands of jokaydia in Second Life, tells us the draft program is available online @ http://tinyurl.com/3wayut. For further info visit the jokaydia Wiki @ http://tinyurl.com/3wayut and the jokaydia Blog @ http://jokaydia.com It’s also on twitter via @jokay. Wednesday, October 8, 12 noon to 2 pm (New Zealand time): Kiwi Educators’ Group session on terraforming. Limited to 10 participants with possiblity of further session based on demand. Participants are expected to be familiar with the basics of Second Life in terms of navigating the terrain, using the camera, teleporting and being able to communicate effectively in the environment using the main chat channel, group chat channels and Instant Messaging. For further information and booking IM Isa Goodman in world. There is no doubt that the importance of Virtual Worlds for recreation, education and business is growing around the world, despite the fact that the print and free-to-air television media often appear to have a vested interest in denigrating them. 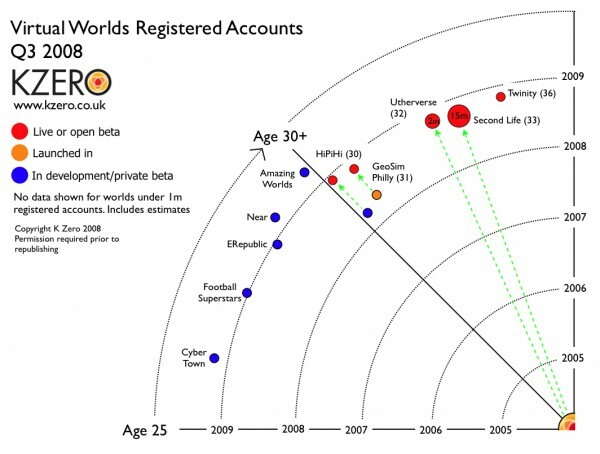 Cambridge, UK, based Nic Mitham, K Zero’s resident guru has just updated his Virtual World universe graphs showing total registered accounts for the virtual worlds sector. 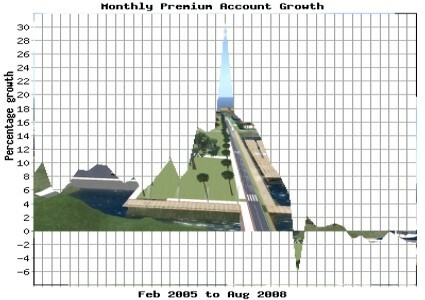 The latest data relates to Q3 2008. In the plus 25 age group Second Life is still leading by miles, despite the plethora of start ups around the world, including in Australia and New Zealand, where we have our own Ongens Virtual World grid. But aside from the below 25 age groups within Virtual Worlds – particularly the tweens and teens – it is to Second Life, I believe New Zealand educators must look if they want to get involved in Virtual World technology, even if it is only a case of getting their feet wet – and despite some of the difficulties. AJ Kelton (“AJ Brooks”), director of Emerging Instructional Technology in the College of Humanities and Social Sciences at Montclair State University, says in EDUCAUSE that Second Life wears the Virtual World education crown today and appears to be poised to do what it can to remain at the top of the pack. He made this comment when observing in his latest column that whether it is Second Life or another virtual world, this Virtual World “foundational movement” is not going away. The question to be addressed in the coming months and years, he says, is how higher education and, subsequently, individual institutions will determine the best way to continue to move forward with Virtual Worlds. Other stories you should look at on this publication include: Higher Education as Virtual Conversation <http://educause.informz.net/z/cjUucD9taT0xNDgwNzEmcD0xJnU9MTAwMDAwMjExOCZsaT00MzQ2NzY/index.html> where Sarah Robbins-Bell (“Intellagirl Tully”) argues that although Virtual worlds can become an important tool in an educator’s arsenal their use requires a shift in thinking and an adjustment in pedagogical methods that will embrace the community, the fluid identity, and the participation—indeed, the increased conversation—that virtual spaces can provide. In looking to the Future: Higher Education in the Metaverse <http://educause.informz.net/z/cjUucD9taT0xNDgwNzEmcD0xJnU9MTAwMDAwMjExOCZsaT00MzQ2Nzg/index.html&gt; Chris Collins (“Fleep Tuque”) looks beyond the capabilities that Virtual Worlds offer at the moment to the possibilities that can be imagined for the future that may be even more “compelling”. Virtual worlds’ technology, like the Internet in general, is changing the way we access and experience information and the way we can access and connect with each other, he says. Melbourne’s ExitReality founder Danny Stefanic is on a winner for the hoi poloi if a test run of his new 3D web browser software is anything to go by. It also might lead to an even greater adoption of other Virtual World’s where one can do real things like building and designing one’s own content. ExitReality claims to be to 3D internet what Google was for web searches, what YouTube was for video and what MySpace and Facebook were for social networking and in a short – one hour – trial it far surpassed Google’s almost amateurish concept with Lively. Available for free at http://www.exitreality.com as a four megabyte download, ExitReality operates as a plug-in for existing web browsers. Unlike most Virtual Worlds Stefanic says it was designed with the average computer in mind. “ExitReality has been built to run on low-spec computers,” he said. “It can even run on dial up, albeit slowly”. It claims to offer “more than 40 billion 3D worlds instantly”, by converting 2D webpages into 3D landscapes that the user can then navigate to view the website’s content. ExitReality also allows users to see and chat with other users who are visiting the same site. SLED lister Barbara Mikolajczak recently provided educators with some links which can spark thought and go some way to answering this question both for oneself and for others – particularly those who control the purse strings. 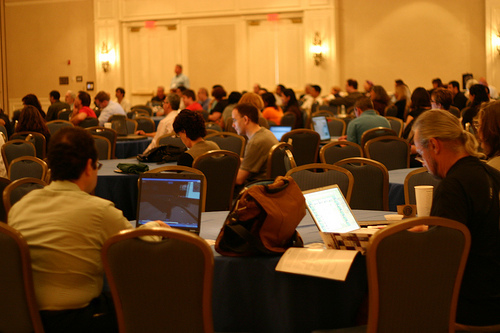 She noted that the question of whether Second Life is a game had been discussed in depth by members of the Immersive Education Initiative. 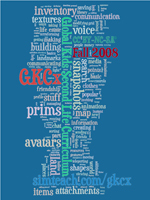 The discussion is archived in the “2008-March” Immersive Education email archives. If you’re currently a member just go into the email archives, and look under 2008-March for the subject “Is Second Life a game?”. It was a very active discussion, with lots of input from a wide range of educators. If you’re not a member you can still get access to the archives. Just visit http://ImmersiveEducation.org/ to join Immersive Education (it’s a free merit-based organization), and once you’ve been given access to the main grid.ied discussion group go into the archives. Once a member you can view all past discussions. More than 40 individual educators from tertiary institutions across the country have expressed interest in becoming part of the Second Life Education New Zealand (SLENZ) project. “The response to our call for expressions of interest has been very heartening,” Terry Neal, joint cordinator of the project said when announcing that SLENZ had now issued a formal Request for Proposal to those who had expressed interest. Funded by the New Zealand Tertiary Education Commission the research project, which has been set up on the Second Life island of Koru (general views pictured at right), owned by NMIT, aims to determine how multi-user virtual environments might be used to improve student learning, had already attracted considerable interest from educators which has now solidified into the 40 formal expressions of interest. 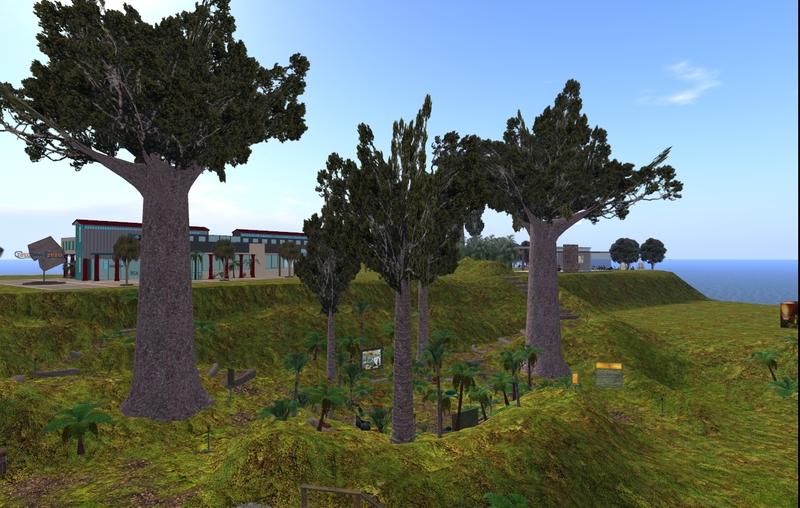 Using the multi-user virtual environment Second Life, the project aims to delineate and demonstrate to New Zealand educators and students the educational strengths of learning in a virtual world as well as involving them on an on-going basis. 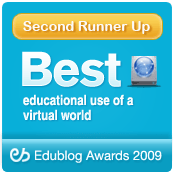 The deadline for the return of proposals from groups of educators who wish to be involved in “engaging with Second Life: Real Education in a Virtual World (SLENZ) project” is October 10.
and the release of the lead educator to the project. It is anticipated that group work will commence in December with a design and development workshop for each project team and lead educator. Click for the full text of the SLENZ Request for a Proposal. Asking where Virtual Worlds were headed, he said several hundred insiders – operators new and old alike, technology providers, and a smattering of advertisers and Hollywood players – had offered their own opinions on the future: opinion which should matter to all those involved in creating education space in VWs. 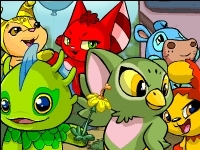 He listed these as “the multi-global war on geekiness”; the users are saying “no” to large client downloads; the trend for virtual brands to enter the real world, as has Neopets (pictured); the charging for brand items which were once “free”, and a growth in “social responsibility” among the creators/marketers of various virtual worlds. To sum up one could say that the virtual world as envisioned by the insiders in LA will be one which is simple, doesn’t create a log-jam inside a user’s computer, promotes its products in-world but sells them in the real world, starts charging for almost everything that has a brand on it, and is as socially responsible as the wholesome Brady Bunch. By these sort of standards one wonders where Second Life might be tracking. Learning Light Ltd and The University Of Sheffield, UK, have carried out a comprehensive Systematic Literature Review of e-learning research in the workplace. They haved made this research available through the e-Learning Centre, based in Sheffield, which is a free information resource for learning and development professionals and academics and staff developers. Australian-based virtual world initiative, Skoolaborate, has “partnered” with the Pacific Rim Exchange project and Global Challenge joining 17 schools from across the Globe to make it the world’s largest ’school based’ virtual worlds project. Westley Field, Director of Skoolaborate, believes that it is the collaborative and philanthropic nature of the project that has struck a chord with schools. Claudia Linden, Head of Education for Linden Labs described Skoolaborate as the “best model I have seen for international collaboration”. If one feels that virtual worlds are still not relevant for education – and there are a myriad who feel that way – one only has to look at the current figures for children in virtual worlds, and extrapolate those figures into future young adults and adults. Like dinosaurs, those educators who don’t get on the Virtual World bus now and bleed a little on the cutting edge could eventually be left behind or worse die out: that’s not to say Virtual Worlds are a panacea for all tertiary education problems, just that they are pointing in a new direction. This thought was brought to mind by Cambridge,UK-based VW guru Nic Mithams’ recent ruminations on “Winners and losers in the kids’ VW space” . Although he pondered on the difficulties of assessing who, where, and what kids are accessing, the problem of multiple registrations and just how big the VW space is, he did come up with some striking answers. Taking the top five worlds in the KT space on a registered account basis he determined a figure of close to 200m kids. Then extrapolating from that figure – a “quick and dirty estimate” – he said he saw the figure doubling to 70m by the end of 2009 and comfortably growing to 150m by 2010. As a result the companies – Barbie Girls, Disney, LEGO and numerous TV-based properties – leveraging real world IP and brand power into the virtual space, he said, already had millions of potential ‘virtual world residents’ – kids who have grown up in a real world wrapped by these brands – and were looking at increasing success. The kids understand them and most importantly they know them. In fact, more than likely they see them every day as toys on their shelves or programmes on their TV. If that’s the case even without the current up take of virtual worlds by adults and soon to be adults educators ignore the phenomena of virtual worlds at their peril – we need to get the skills now on virtual ground so that we can design the education programmes that are going to be the key of future life-long learning based around our tertiary institutions. This is particularly so for a country like New Zealand which could be so easily left behind in this revolution/evolution that is occurring given there are senior executives in our telecommunication organisations who believe third world communication products are good enough for this country adn educators who still see virtual worlds as no more than “games for nerds”. But read Nick Mitham, [http://www.kzero.co.uk/blog/?p=2461] particularly on the need for relevance to be a winner in VWs. I think his conclusions will set you thinking. San Jose State University’s Jeremy Kemp has alerted SLED readers to what he terms “not his (and Ken Haycock’s) magnum opus, but it is peer reviewed” views on “Immersive Learning Environments in Parallel Universes: Learning through Second Life”. Tip: If you Google “slideshare” and “slcc08” you may find the original Powerpoint, which can aid your viewing experience. October 9, 2008, at 8pm (BST), renowned UK author Terry Pratchett will appear in Second Life on “Nation” island to take part in a Q&A with fans from across the globe, as a part of a month-long Second Life promotion of his new children’s novel, Nation, published in the UK September 11, by Doubleday, and in the US September 30 by Harper Collins. Visit Elysian isle in SL to get a note card with details of his visit and a Treasure Hunt. Second Life could be a promising educational platform under the right circumstances, according to The Metaverse Journal’s coverage of the Second Life Education Community Convention (SLEDcc) education conference at Tampa in Florida and in SL over the last weekend. “However, not only does Linden Lab need to make preparations at their end to make the magic happen (See following story), there are plenty of opportunities available for educators, and the wider public, to do their bit to support and improve education on the Second Life grids, TMJ concludes. Stan Trevena, director, Information and Technology Services, Modesto City Schools, recently made the point that all those currently using Second Life for classroom use need to be aware of, and plan for, downtime. “It’s not a matter of if, but rather when (and how often) it will go down,” he said. He was replying on SLED to a question raised by Scott Diener, Associate Director, IT Services Academic & Collaborative Technologies, at the the University of Auckland. “The SL platform is far from stable, and even a casual encounter with it should tell you that,” Stan said. I can only heartily concur. This is made worse in New Zealand by our third world-standard telecommunications systems. “This stuff is still cutting edge, and it’s not cutting edge if you don’t bleed a bit,” Stan said of SL, noting he had vented more than a few times about the stability, but was something that was just are not going to occur at this point. He said he believed that stability would only come when the servers were distributed, and SL got away from the grid model. “… there is a ceiling for concurrent usage and that number has not improved significantly in the past year and a half,” he said. “ And I’ve seen nothing to indicate that it’s going to make any huge leaps anytime soon. When we are able to host our own servers/grids we will have stability. There is reason for optimism, however, Stan noted: Linden is working on distributed servers (with cross server teleportation like IBM’s project), OpenSim is maturing (not fast enough), Sun’s Wonderland just went to v0.4 (v0.5 will be adding a new graphics engine and avatar model), Croquet is out there, and Google’s Lively is retuning and focusing on business and education needs in their hit list. For the record Scott Diener had asked in SLED about the scalability of the SL platform following the cancellation of a New Zealand SL Educators meeting because with 67,333 current logins SL could handle no more load. Diener recently asked Linden Labs how I could get a full refund for his university sim because of highly unreliable performance. He noted that for SL teaching, “we must have assurances that service will be available” on a 99.99% reliable basis because classes cannot be rescheduled and the time is “irrevocably lost”. His Linden Labs reply to a request for a discussion about a Service Level Agreement (SLA) to see if there might be a way forward left him somewhat frustrated, to say the least. If education is the new byword of SL, the Lindens do need to get their act together. Otherwise OpenSim and others will take their place. One wonders when TelstarClear is going to provide New Zealand with the same service in Second Life as they are now providing their Aussie clients. In Australia Telstra doesn’t meter its BigPond customers on Second Life. In other words they get their bandwidth usage for free…. unlike New Zealand where TelstraClear’s head honcho is not much interested in high speed virtual worlds, noting that third world bandwidth speeds are quick enough for Kiwis and they don’t need any faster internet. Of course, they don’t when TelstraClear is creaming it. Its only unmetered portals in this country are for a few teenage games. 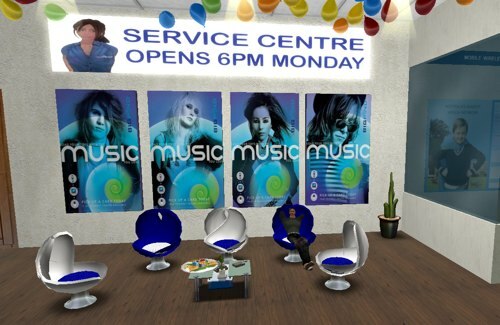 However, Telstra Australia, which has 16 sims, has taken the next step in the ongoing evolution of its foray into SL with the launch of a staffed customer service centre. Telstra-employed avatars are to be available between 11am and 10pm Monday to Friday AEST, to answer “service-related queries”. It would be great it TelstarClear could give Kiwis a similar leg up or are we just being ripped off by both the big telco organisations. There is some perception of light at the end of the tunnel as has been noted by Roland Legrand (www.metanomics.net/blog/roland-legrand). Based on Gartner’s Hype Cycle public virtual worlds are in the Trough of Disillusionment (after the hype), but hold potential for the future, he said late August. In fact, he pointed to Gartner’s latest prediction that public virtual worlds would see mainstream adoption within two-five years, as reported by Virtual Worlds News reports based on Gartner’s report Hype Cycle for Emerging Technologies. There also were signs, he said, that the perception was changing with mainstream media such as The Economist and BusinessWeek publishing some positive articles.